Là nam Foileagan – Pancake Day! 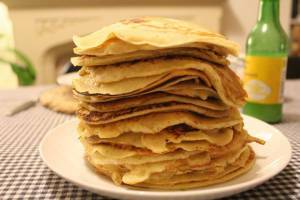 In France (and New Orleans) they call it Mardi Gras (Fat Tuesday) but in Scotland today is Pancake Day! Cò bhios a’ dèanamh fhoileagean an-diugh ma-tha? Who’s making pancakes today then? In the christian tradition, Shrove Tuesday is the last chance for a blowout before lent begins. In actual fact, winter stores would have been running low by this time anyway so if the christians wanted to introduce a fast into their calendar, late winter was the perfect time to choose. Winter stores were running out, the new growing season was yet to begin – folk had little choice but to tighten their belts and try to hold on until spring.